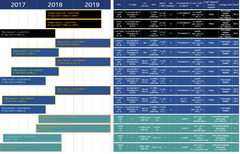 The roadmap for Intel NUCs in the coming years seems to be a rather interesting one with a host of NUCs in different configuration options starting from the 10W 'Gemini Lake' Celerons all the way till the 100W Kaby Lake-H Core i7-xxxxK. NUCs based on the Coffee Lake and Kaby Lake-H CPUs also come with support for Thunderbolt 3 and Intel Optane memory. Intel's roadmap for 2018 and beyond for its NUC (Next Unit of Computing) PCs presents some interesting stuff. NUCs are mini-PCs designed by Intel that aim to provide a full fledged desktop PC experience in a compact 4x4 form factor. We see that a total of 7 new NUCs will be launching in 2018. These NUCs will be catering to different price segments starting with the entry-level 'June Canyon Celeron' (2 cores) and 'June Canyon Pentium' (4 cores), which are based on the 'Gemini Lake' iteration. These NUCs should land sometime in Q1 2018. Not surprisingly, NUCs powered by 'Gemini Lake' do not have support for Thunderbolt 3 or Intel Optane memory. As we approach Q2 2018, we see that Intel will be launching the 'Hades Canyon' and 'Hades Canyon VR' NUCs featuring Kaby Lake-H CPUs with discrete graphics succeeding the 'Skull Canyon' 6th gen Core i7 Skylake-H models. The 'Hades Canyon' range comes with 65W and 100W Core i7 CPU options, with the highest configuration using a 100W i7-xxxxK (4 cores / 8 threads) processor, support for up to 32GB DDR4 2400 MHz memory, 2 Thunderbolt 3 ports, support for Intel Optane memory, and ready for VR. Q3 2018 will see the launch of 'Bean Canyon' NUCs, which will be available in a range of 'Coffee Lake-U' Core i3 to Core i7 configurations. NUCs that sport the 28W 'Coffee Lake-U' chips come with support for Thunderbolt 3 and Intel Optane. An interesting aspect of the above roadmap is that the 'Bean Canyon' and 'Hades Canyon' series are shown to be using Xth Gen Core ix CPUs. At this point, we are not exactly sure whether the 'X' stands for 10th generation or is just a placeholder. Starting from the 8th generation CPUs, Intel has decoupled the generation numbers with architectural changes meaning, a generation can now comprise of CPUs that span multiple lithographies. Given that 'Kaby Lake -R' notebooks are just beginning to land and that 'Coffee Lake' PCs sporting K-series chips are set for a Q4 2017 launch, 'X' here could very well be a placeholder. The roadmap also shows the upcoming NUC versions holding up almost till the end of 2019, which could mean that a 10nm 'Ice Lake' CPU NUC is not likely to come anytime soon. Overall, the above roadmap seems to hold good promise of delivering high-end computing in compact form factors. As always, all the Intel NUCs listed in the roadmap can be purchased as Kits or standalone boards (with soldered CPUs).